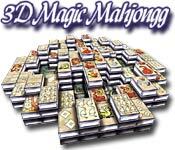 3D Magic Mahjongg - 4th of July - This Mahjongg Game is a Yankee Doodle Dandy. Play patriotic Mahjongg Solitaire in stylish 3D backgrounds. Clear the board by removing the 144 tiles in matching pairs. Enjoy special "4th of July" holiday graphics and patriotic music.